The royal wedding was three weeks ago today and by all accounts, we have all eased back into normal life. But there were some really amazing details that will certainly be inspiring brides for years to come. I wanted to take a closer look to see which aspects of the wedding that the world watched would be trending this wedding season. Not that the bride has much choice typically, but this sapphire stunner made headlines around the world for its beauty, its history and the fact that it is not your standard engagement rock. The main reason for the popularity colorless diamonds is that they are not only classic but they go with anything you could ever wear. I wrote a post about the popularity of colored engagement rings catching on with celebrities, it might just catch on with the rest of us soon. So many people, myself included, were surprised to learn that Kate decided to do her own makeup for the most watched wedding this century. She did take lessons from a makeup artist but chose to apply by herself. For most brides, makeup and hair stylists are necessary vendors for a few reasons- to cut down on the anxiety of perfecting the wedding day look, having access to a professional and lastly because for most brides these services are a rare luxury. Celebrities get their hair & makeup done on a weekly basis, so are they 'over' this luxury? 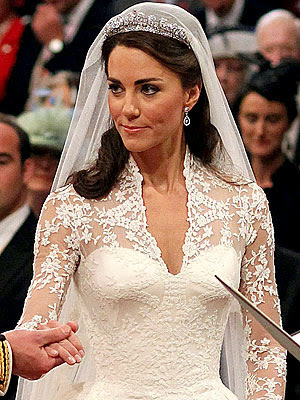 It was speculated that Kate made specific choices with her wedding to represent herself as "one of the people" and this was a very good example. Today's bridesmaids dresses are always well thought out- coordinating color themes, wedding formality, season, etc. White is traditionally a color only worn by the bride at the wedding but the trend of white bridesmaids dresses was gaining speed even before the royal wedding. Not only have I seen this on wedding blogs, but Felicity C Weddings had a client in September 2010 who had two bridesmaids, both in knee length white dresses. 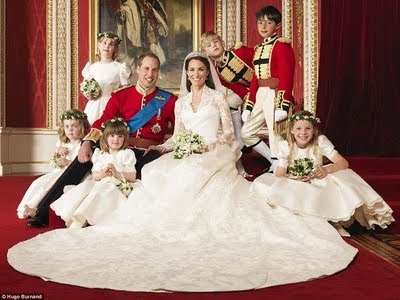 Kate's sister Pippa looked amazing, although a bit orange for my tastes, and may give more steam to this growing trend. A lot of decisions for the royal wedding were dictated by tradition and incorporating royal children (cousins, nieces and nephews) was certainly followed. Most brides want a wedding party full of their best friends and siblings, I've had clients with wedding parties ranging from 4 total to 28 total! Many couples are choosing not to have a ring bearer or flower girl either because they don't have any children in the right age range or they are not inviting children to the wedding at all. Reports came out a few weeks before the wedding that Prince William was not going to be wearing a wedding ring. The traditional reason to wear rings is to have a visible/ tangible sign of your committment and marriage to show to the world. Which begs the question that if your wedding was watched around the globe by millions of people, do you need a ring for anyone to realize that you are 'off the market'? Most couples are excited to wear rings and look forward to showing them off as a new phase in their lives. I think this is a royal exception to the rule and husbands across the country will still be required to wear their new bling.